Two alpine giants grow alongside each other in this tussock herbfield on Whitcombe Pass. At the rear, the giant spaniard (Aciphylla scott-thomsonii) is a member of the carrot family, and is one of the largest and most fierce of New Zealand’s speargrasses. It forms clumps of spiky leaves up to half a metre tall. 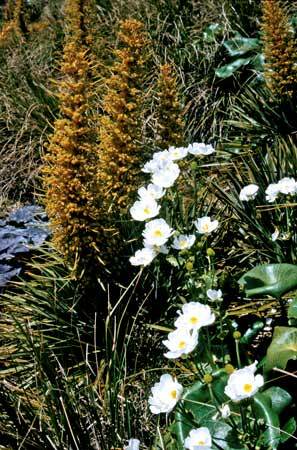 Male and female flowers occur on separate plants, and masses of flowers are borne on 3-metre-tall flowering spikes. The Mt Cook lily (Ranunculus lyallii) is not a lily at all, but the world’s largest buttercup. Its large white flowers are about 8 centimetres in diameter, and its circular leaves can grow up to 40 centimetres wide.